Louise Swartzwalder Bellville Star Jesse Gaines and Clayton Bockleman, with the L.J. Irving firm, get equipment ready for demolition of the old Bellville elementary school, which will start Monday. CLEAR FORK VALLEY – Demolition of the 100-year old elementary school building in Bellville will start Monday. A crew of workers from L. J. Irving was in Bellville this week, setting up a construction trailer and positioning a crane, which will be used in demolition. 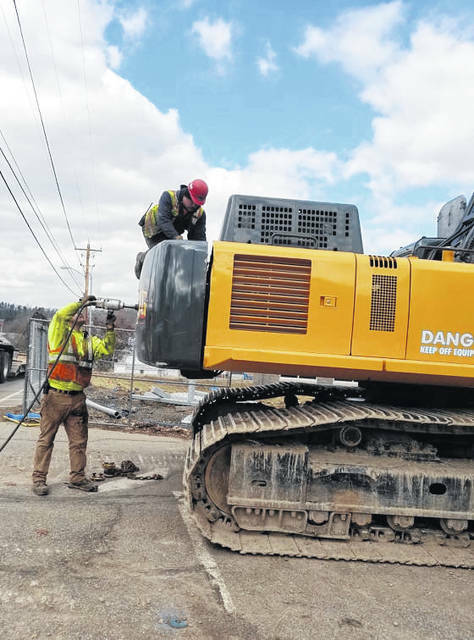 Two workers, Jesse Gaines and Clayton Bockleman, were working with equipment Tuesday, March 19. Demolition of two elementary buildings, in Bellville and Butler, has been viewed with some reservation by a few folks. Tours of the buildings were available earlier in the year. Two shining new buildings exist in both villages. Those were open to students after the start of the year. He said it will be “peeled apart” so some pieces can be preserved as souvenirs. The process is a “deconstruction,” Gaines said. There will not be an implosion. This sometimes is used to rapidly take down a structure. Blasting from the interior makes the process quick. Gaines said a large crew of workers will be at the Bellville site, when the process starts. Larry Irving or Marty Irving, principals in the Irving firm, will be there, Gaines said. Abatement of asbestos in all buildings has been undertaken. The Bellville building was the first where that process was completed. The Butler building will be taken down next. In the long term, the Hines Avenue building will also be torn down. District offices will be eventually be housed in the annex, next to the Bellville elementary building. https://www.thebellvillestar.com/wp-content/uploads/sites/39/2019/03/web1_big-rig-in-Bellville.jpgLouise Swartzwalder Bellville Star Jesse Gaines and Clayton Bockleman, with the L.J. Irving firm, get equipment ready for demolition of the old Bellville elementary school, which will start Monday.